A substantial portion of the discussions surrounding the ongoing Korean peace process is centred around issues stemming from the positions of the United States, China, Russia and Japan towards both Korean states. 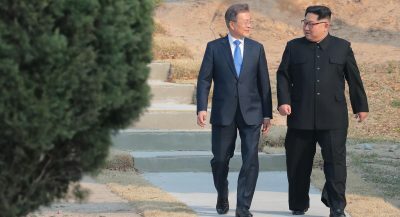 But while the historic relations of Korea with the superpowers including its two superpower neighbours and other members of the wider north east Asian community are relevant to present matters, as a sovereign people, only the Koreans themselves can decide the ultimate course of the peace process. The two existing Korean states should not continue to be artificially separated due to foreign sanctions, threats or diktats and nor should anyone force economic harmonisation against the will of the Korean people, even though it would appear that such models are increasingly favoured in both Pyongyang and Seoul. Instead, any such decisions regarding a peaceful future for Korea must be voluntary on the part of Koreans themselves. While such sentiments may appear to be self-evident, the history of Korea’s artificial division is demonstrative of the fact that these basic principles were discarded in the 1940s and 50s. After the long Japanese occupation of Korea ended in 1945, the country was split into zones of occupation between the USSR and USA, much as Germany and Austria were split into separate zones of occupation after the Second World War ended in Europe. As time wore on, the Soviets and Americans could not agree on the best way to implement a Korea wide election that would have established a new post-war government. As a result, rather than continue negotiations between the two superpowers at the newly formed United Nations, UN officials under the heavy influence of Washington instead allowed for a unilateral election to be held only in the US occupied portion of Korea (the south). What transpired was a deeply controversial election in 1948, one marred by violence where the far-right strongman Syngman Rhee literally attacked leftist activists, voters and organisers in an election described by multiple international observers as deeply unsatisfactory. Throughout 1948 and 1949, violence continued to foment in the south as rebellions grew against Syngman Rhee’s authoritarian leadership. In 1950, forces of the DPRK which also proclaimed its statehood in 1948, crossed into the south to relieve the Korean freedom fighters of the south, thus beginning a three year long war in Korea during which 2.5 civilians were killed or wounded. While the Armistice of 1953 solidified the re-divided Korean peninsula with the 38th parallel being the dividing line, in the following year the Geneva Conference was held in order to determine the future of both Korea and French Indochina (the modern states of Vietnam, Laos and Cambodia). While the conference was unable to make any progress in respect of Korea, it ironically set the stage for the partition of Vietnam on the 17th parallel with Ho Chi Minh’s communist Vietminh forces controlling the north and the western backed State of Vietnam led by Ngo Dinh Diem forming in the south after Diem refused to hold countrywide elections- opting only to hold controversial elections in the south, thus repeating the geographically (and ideologically) unilateral approach of Syngman Rhee. But while Vietnam reunited after 1975, the Korean people remain divided to this day. This is why it is crucial that the failures of the Geneva Conference of 1954 are not repeated in the present day Korean peace process. Since the early 1950s, both Korea states have matured into sovereign nations but nevertheless, the legacy of the division of Korea and the war the followed has led to many international players and the US in particular to seemingly taking for granted the fact that foreigners somehow have a unique role in determining the future of a single Korean race. The warm embrace shared today between Kim Jong-un and Moon Jae-in as the South Korean President’s plane landed at Pyongyang’s airport is a helpful reminder that a people divided by foreigners can only be united through discussions and agreements among Koreans from both sides of the border. Koreans on both sides of the 38th parallel were cheated of their self-determination by the hand of neo-imperialism in the 1940s and it is high time that those who think they can dictate to either Korean state realise that a permanent peace is only possible through ever more frequent north-south dialogue, the kind of which transpired today in Pyongyang. Adam Garrie is Director at Eurasia future. He is a geo-political expert who can be frequently seen on RT’s flagship debate show CrossTalk as well as Press-TV’s flagship programme ‘The Debate’. Garrie has also commented on geopolitical events on international television and radio in the United States, Lebanon, Russia, Pakistan, Germany, Britain and Ecuador. A global specialist with an emphasis on Eurasian integration, Garrie’s articles have been published in the Oriental Review, Asia Times, Geopolitica Russia, the Tasnim News Agency, Global Research, RT’s Op-Edge, Global Village Space and others.